Top 10 Ways to Get Kids Involved in Your Outer Banks Vacation! Dive into the Outer Banks before your vacation even starts! 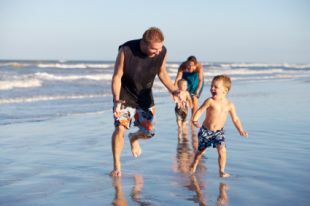 You're ready for your Outer Banks vacation and you want to make sure the kids have a fabulous time too. Now it's easier than ever! Check out Sun Realty's Top 10 Ways to Get Your Kids Involved, our list of favorite books and DVDs, and beach craft projects. You're sure to start your Outer Banks vacation fun right at home! Plan ahead and get the kids involved! Set up a rough itinerary of the activities for the week. Spend a day in Corolla, spend a day on Roanoke Island, and another touring Ocracoke Island. Alternate between kid activities and adult interests to keep everyone interested and happy. Local entertainment is always a winner - make your plans ahead of time. Roanoke Island Festival Park, Chicamacomico Lifesaving Station, Daredevils baseball games, OB Music Showcase or music festivals are great choices. Get the kids financially invested in the vacation! 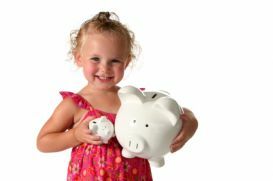 Have each child save up for special souvenirs or give them a set dollar amount prior to leaving home. Schedule equal time for each child to search for that special something of his/her choice. Plan activities that are "kid-friendly" and allow them to be kids. Active, hands-on activities win with kids every time. Imagine how much fun it would be to pet a baby alligator, touch a stingray, take a surfing or hang gliding lesson, or see a reenactment of heroic ocean rescues! Get kids involved on an emotional level. 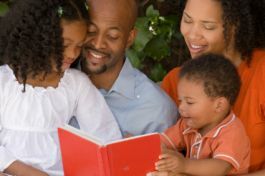 Reading books or watching DVDs about the Family preparing for Outer Banks vacation by reading together is the #1 way to get kids excited about vacation. See the below list of books and DVDs about Outer Banks history - such as the Wright Brothers historical flight, Blackbeard's terrifying reign over the Atlantic coastline, the relocation of the Cape Hatteras and the plight of the wild horse of Corolla. Check them out at your local library or click on the links provided and purchase a copy for the family! Meet the locals! Visit shops, stores and restaurants off the beaten path. You can usually learn more about the Outer Banks from the locals than the cookie cutter places. Also check out any day camps going on during your vacation. They will meet local kids and make memories that will last a lifetime. Give each child a disposable camera so they can take pictures of whatever they want. A greener option is to provide each child with an inexpensive digital camera or let them use the family camera to take part in vacation photography. You'll be amazed at the beautiful pictures you'll get from their vantage point. Provide each child with a small treasure box to store all of their Outer Banks vacation finds like shells, feathers, ticket stubs, photos, etc. Give them the opportunity to decorate the box in their own personal style. 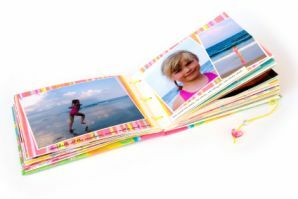 Scrapbooking is also a great way to get kids to actively participate in vacation time. Your week can be action packed from the minute you arrive on the Outer Banks, but don't forget to set aside time to sit by the pool, build sandcastles on the beach or play in the surf. This laid back, unscheduled time can create the most notable memories for the kids. Take time to spend one on one with each child and listen to their thoughts and feelings about the upcoming vacation. Kids may have anxiety about what will happen while your on vacation, the places you'll visit, and the people that will be accompanying you (grandparents, family friends, etc.). Since kids don't usually travel on a regular basis, they may need some reassurance that all the comforts of home will be availabile - especially you! The best thing about the upcoming vacation is spending time with you! No work and other distractions to come between you and your kids. Take advantage of it and make every minute count. The legendary Matyiko brothers attempt to move the Cape Hatteras Lighthouse while battling rough coastal conditions. Time is running out to move the 900-ton brick structure to its new location. Will they succeed or will the waters of the Atlantic claim another victim? Follow the brothers through their epic journey of discovery that culminated in the first successful manned flights. Your entire family will enjoy insights from aviation experts, examination of numerous machines invented by the Wrights, photos of Kitty Hawk taken by the Wright Brothers themselves, actual footage of the first flight in 1903 and more! A young girl is sent off to Pirate School to 'toughen up'. While attending Pirate School, she overhears a plan to that involves kidnapping and ransom. Adventures on the open sea ensue! Appropriate for ages 5-8 . Part of a historical series Young Fliers presents the boyhood of the brothers, Orville and Wilbur Wright. Appropriate for ages: 9-12. A wild pony named Seabiscuit lives on the Outer Banks of North Carolina with her mother and father. While most of her life consists of chasing seagulls and playing with turtles, she learns an important lesson about personal responsibility during a hurricane. Appropriate for ages: 3-8. Two teenagers follow the lights over Teach's Light and are thrown back in time by a sudden explosion only to find them themselves as observers of Blackbeard's life! Appropriate for ages: 9 -12. A page-turning mystery about a shipwreck survivor and a family on the Outer Banks. Provides detailed descriptions of the Outer Banks. Appropriate for ages: 9-12. A group of kids attending the Centennial of Flight celebration find themselves racing through aviation history. Appropriate for ages: 9-12. A group of kids find themselves solving a mystery during the Golden Age of Piracy. Explores the world of seashells, crabs, sea stars, sand dollars, and other things at the seashore. Fly back to an exciting time with the Wrights' written descriptions and eyewitness accounts! Follow the experimental trail through a wide selection of photographs taken by the Wright Brothers themselves. Appropriate for ages: 9-12. - Any other decorative item that strikes your fancy! To add trim to outer rim of sole: Choose a trim and cut a length to fit around the outer rim of each sole with a 1/2-inch overlap. Cut separate pieces of trim for the left and right sides of the foot strap, as well (again, the pieces should overlap 1/2 inch where the ends meet in the center). To add trim to flip-flop straps: Use the process above to attach the 2 pieces of strap trim. Allow the glue to dry for at least an hour before your child takes her newly decorated footwear for a walk. Print the patterns and use them to cut fish from scrapbook paper. Cut each fish in half horizontally, from tail to nose. Lay clothespins on their sides. Glue the top half of the fish to the upper half of the clothespin. Glue the bottom half of the fish to the lower half of the clothespin. Glue on googly eyes. Open and close the mouth by squeezing the clothespin.